Scarlett O’Hara had her Tara, Heidi had the Swiss Alps, I have my midwestern corner of America, and my Norwegian relative has his beloved Brønnøysund. When my husband and I visited my 80-year old relative, Per Moen, and his American wife, Joan, during our trip to Norway, I took many vivid photos of the land and people. One, of the ice blue Norwegian fjord framed by majestic rocks, is the background on my computer screen. Another favorite shows me riding an Icelandic pony along the Norwegian seacoast. The afternoon was misty, and I felt like Catherine in Wuthering Heights riding across the heather and the moors. A third is of the Sami, indigenous inhabitants of northern Norway, wearing traditional costume. They invited us into their traditional lavvu, or teepee, and served us reindeer broth. While reindeer grazed outside, we warmed ourselves by the fire, viewed handicrafts and listened to stories and songs. 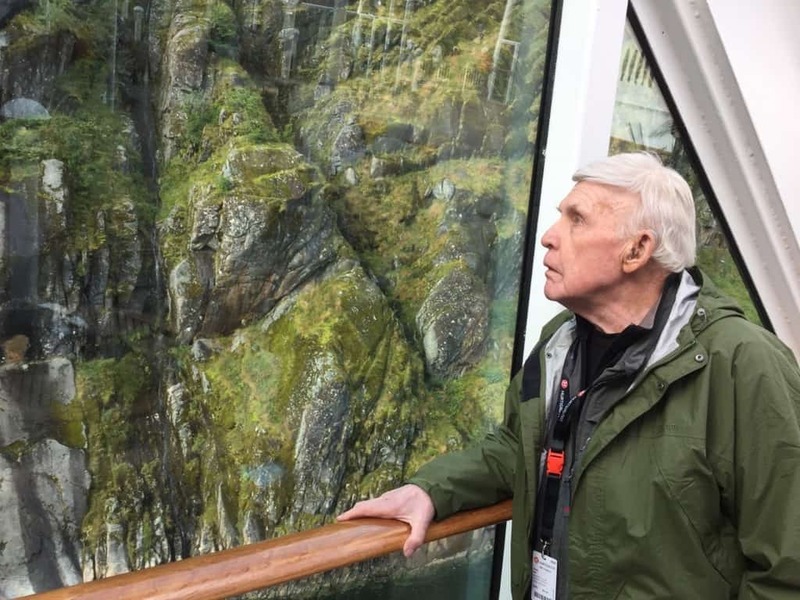 These are all remarkable in my memory, but the image I’ll always remember is the one of Per on the deck of our ship, The MNS Trollfjord, looking over his land. When The Trollfjord docked at Brønnøysund, only six miles from where Per was born, the four of us hurriedly disembarked knowing our time was limited. Per and Joan could have taken us through the charming town with its colorful store fronts or to Torghatten, a famous mountain with a hole in the center, but Per chose to show us the white clapboard church where relatives were buried. His eyes moistened, and I learned he wants his ashes strewn at sea and in his beloved mountains. His country, his heritage, his people. Per told me that it’s a common practice for Norwegians to devote Sundays to hiking. As the four of us walked along, I wondered how many of my ancestors had also walked these paths. Had they, too, stopped to sample the raspberry-like cloud berries as I was doing? Had they, too, reveled in the crispness of the air and the sight of sheep and reindeer roaming free? Per’s love of the land runs deep, but so does his devotion to family. I believe he partly learned this from his mother who had to leave home to be a field hand at age ten. She had four younger siblings and there wasn’t enough food for them all. Like many Norwegians, Per was a seaman, working his way up from a deck hand to a cruise ship captain. When asked why he loves his country, he answered that his government cared about him. In turn, he cares about his culture, the land and sea, and his community. Per has a daughter and a grandson. This proud Norwegian has passed on his love of country to them, their heritage, their people.